(500) Days of Summer (2009), Dir. 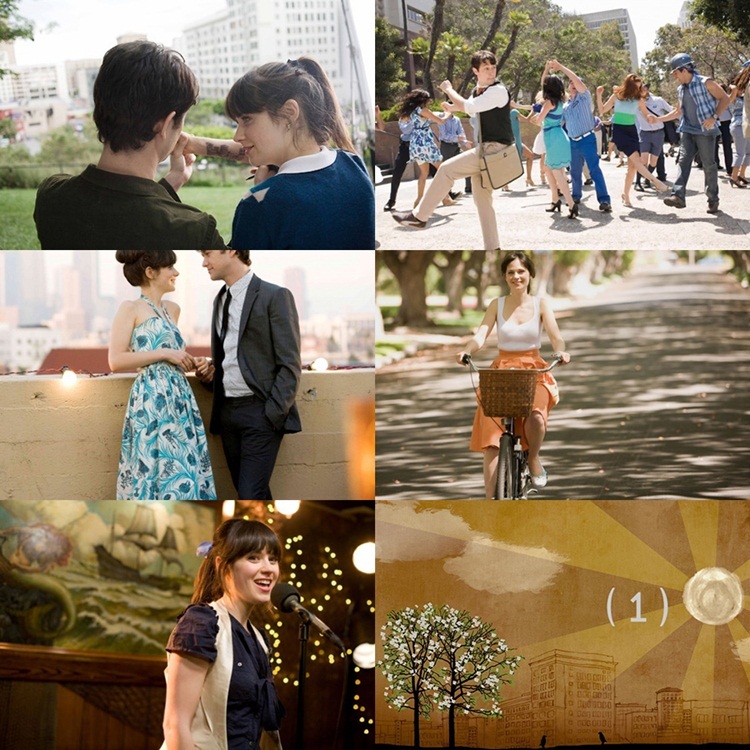 Marc Webb - Despite its summery title, (500) Days of Summer spends most of its time with warm autumn tones. 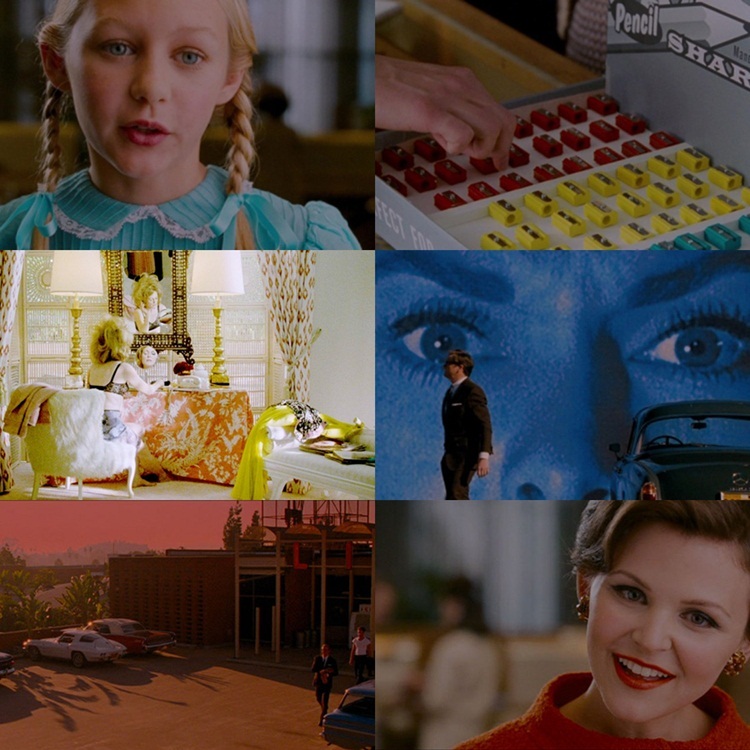 However, thanks to Zooey Deschanel's beautiful blue eyes, Webb decided to dedicate some of the film's palette to the colour blue - as evident in the dance sequence. Plus, a good bit of the film's colour comes from the awesome clothes that Summer wears. A Single Man (2009), Dir. Tom Ford - This is a depressing movie about suicide, but let's not forget that it is the debut feature of fashion designer Tom Ford. He adds so much style to the film (to the point that most people complain that it is style over substance, but I whole-heartedly disagree), whether it be through the clothes or the art direction. His attention to detail is impeccable, and that's what you could expect from someone like him. Beginners (2010), Dir. 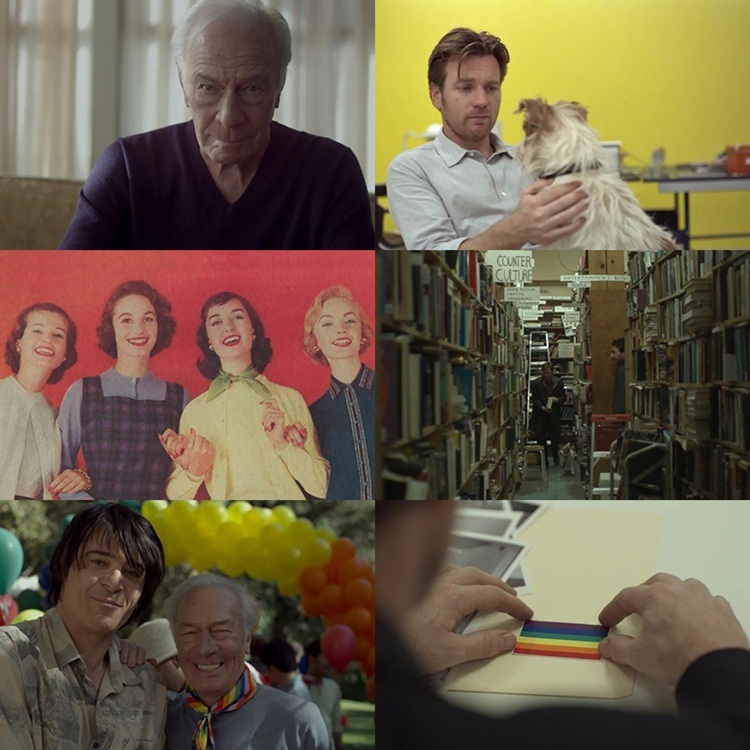 Mike Mills - Like (500) Days of Summer, Beginners spends a lot of its time in autumn tones, but there are many prominent flashes of colour throughout the film. They're most evident in the "this is what _____ looks like..." montages, with one montage even just showing blocks of bright colour. Otherwise, the clothes can reflect it - from Christopher Plummer's bright scarves to Melanie Laurent pairing a red dress with blue stockings. Boogie Nights (1997), Dir. Paul Thomas Anderson - Right from the very beginning, with that famous tracking shot around the night-club which introduces everyone within a single take, you know just how colourful Boogie Nights is going to be. And it retains that colour right until the end, with the bright-yet-jaded colours of the 70s coming out in full force. Eternal Sunshine of the Spotless Mind (2004), Dir. 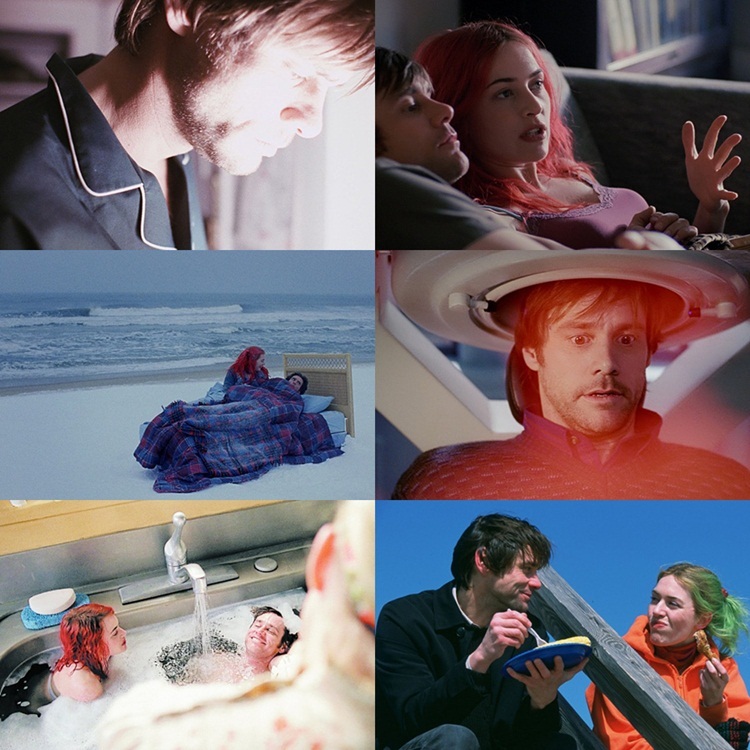 Michel Gondry - I suppose a film that has a main character who likes to change her hair colour all the time should be quite colourful, and that's exactly what Eternal Sunshine of the Spotless Mind is. The reason it is so colourful, though, probably comes down to its stellar imagination. The Fall (2006), Dir. Tarsem Singh - There's absolutely no contest: Tarsem Singh's The Fall is the most colourful, and probably the prettiest, movie ever made. It goes through all of the realms of the imagination, apparently without any special effects, but sadly only wound up with a small release that garnered a cult following. Singh has a wonderful attention to detail, which was also evident in this year's Mirror Mirror, which wasn't great but it is definitely one of the best looking film's of the year. Gone with the Wind (1939), Dir. Victor Fleming - Between this and The Wizard of Oz, Victor Fleming had a damn fine year in 1939 with Technicolour. 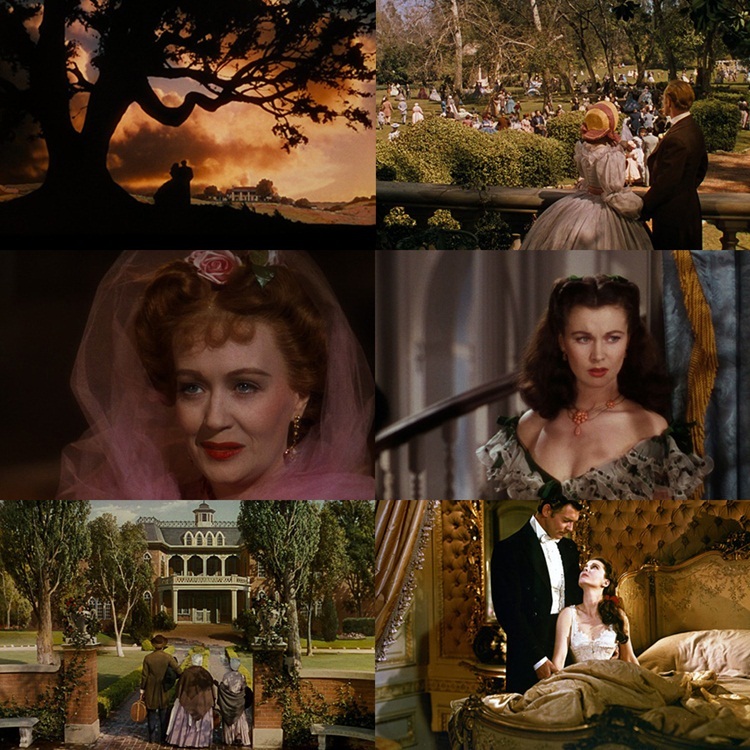 Gone with the Wind is a stunning example of early Technicolour at its finest, and it seems to get more impressive with age. I can barely believe that this film was made over 70 years ago. Hairspray (2007), Dir. Adam Shankman - Musicals have the largest capacity of any genre to use colour extremely well, and Hairspray is no exception. Everything about this film exudes colour, especially the many colourful big dresses, which always make me jealous. Meet Me in St Louis (1944), Dir. 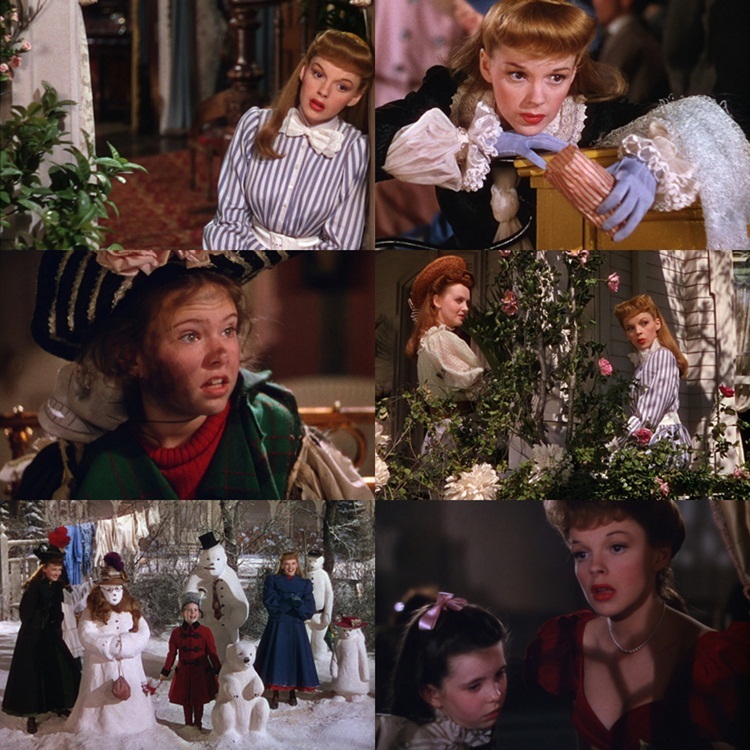 Vincente Minnelli - This movie tends to make me feel all warm inside because I watch it every single Christmas night without fail. Plus, these early MGM musicals tend to be amazing in Technicolour. This movie always reminds me of a gingerbread house, because it is just that colourful and cute. Moulin Rouge (2001), Dir. Baz Luhrmann - Say what you will about Baz Luhrmann, but there is no denying that the guy knows how to use colour on film. 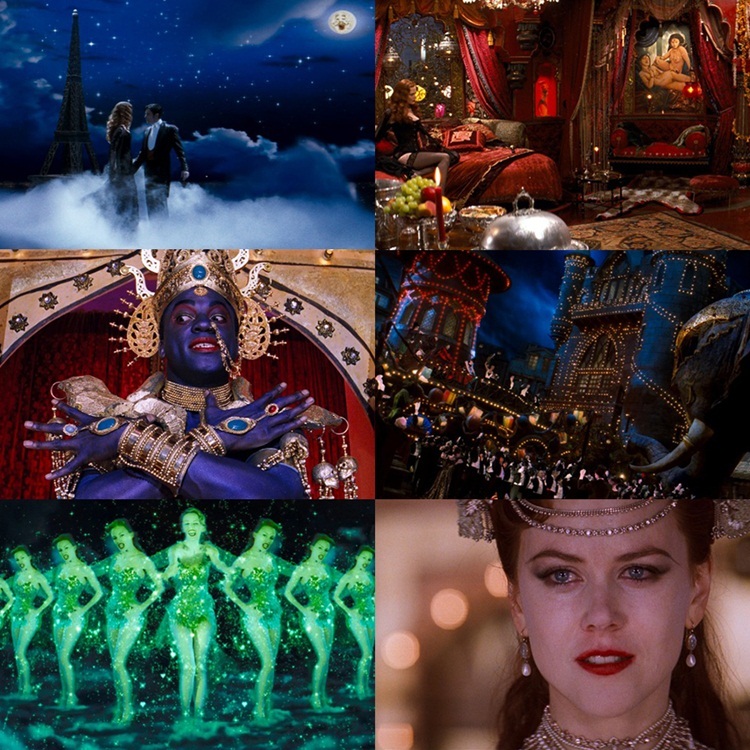 Moulin Rouge is the best example of his talents, and maybe one of the best examples of film as an aesthetic medium. The exuberance and vibrance of the film is something that I've never really seen matched by anything else. But I'm sure The Great Gatsby will rival it. 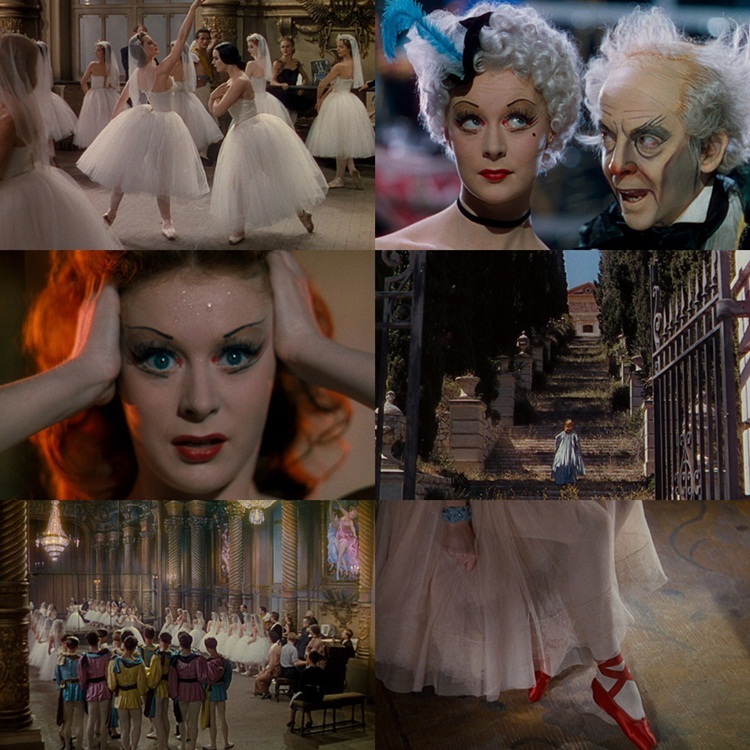 The Red Shoes (1948), Dir Michael Powell and Emeric Pressburger - The Red Shoes is another example of stunning early Technicolour, especially in the ballet sequence. Powell and Pressburger were masters with their colour, obvious in both this and Black Narcissus. Scott Pilgrim vs. the World (2010), Dir. Edgar Wright - Scott Pilgrim vs. the World isn't a film that does things the easy way. The graphics and effects in this film are out of this world, making this film a prime example for how editing can really change a movie. It is just a non-stop adrenaline rush, emphasised by the many colours it has in it. 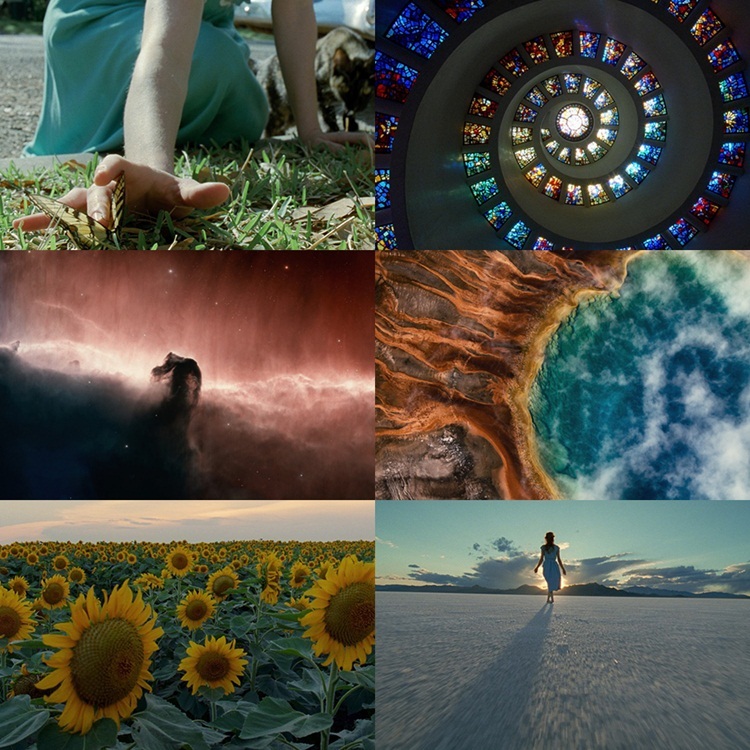 The Tree of Life (2011), Dir. Terrence Malick - Any Terrence Malick film could be up here. The guy knows how to make things beautiful. The Tree of Life is probably his most beautiful work. The colours that we see in this film are all the colours of life, from the Creation sequence to the beautiful sequences of people being people. And then there's Jessica Chastain's hair. It is all so beautiful. The Umbrellas of Cherbourg (1964), Dir. Jacques Demy - Again, this is another musical that makes the most of colour. The colour bursts out of this film, particularly because of the pink wallpaper that adorns the umbrella shop - which is also filled with colourful umbrellas. Just like there's no escaping from the singing, there's no escaping from the colours. And don't get me started on Catherine Deneuve's beauty. What do you think? What are your favourite colourful films? It gonna be summer there? Although I don't get snow were I live, global warming has meant daily heavy downpours like the world is about to end (Mayans... 2012... anyone?). Great selections and beautiful photos... I'd add Amelie and perhaps The Wizard Of Oz on my list. I'm seing Life Of Pi this Thursday and that looks visually amazing too. Hahaha, poor you. Don't worry, it practically rains all summer here. I love those two picks. This list could go on forever! Life of Pi does look visually amazing. Wow... let's see. The Red Shoes, The Tree of Life, Eternal Sunshine of the Spotless Mind, Moulin Rouge, Scott Pilgrim vs. the World, Marie Antoinette, and Boogie Nights are great mentions. There's also Black Narcissus, Made in U.S.A., A Little Princess (1995 film), and Blue Valentine. I thought of adding Blue Valentine. That movie has a stunning use of colour for such a depressing movie. I suppose it is all in those fireworks. Adorable list. I'm going to make one like this soon. Yayy for Marie Antoinette!! Yay! I know that your one will be awesome. Great concept for a post! This would make an amazing blogathon, don't you think? I couldn't agree more with your list...your screencaps are beautiful! It would - maybe that's an idea. Thanks! I still need to see this! And perhaps a few more Stanley Kubrick movies. 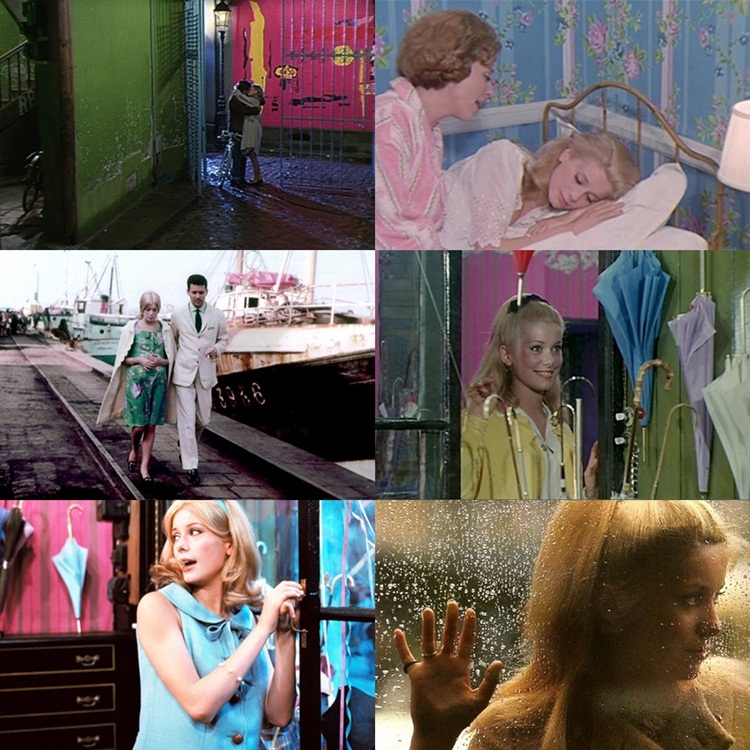 I'm so glad you really like The Umbrellas of Cherbourg for its colour! I also guessed immediately that The Tree of Life would be there :) Great list! Hmm....just trying to think what I like for colour...probably a Miyazaki film like Spirited Away, because I'm predictable like that :P or Moonrise Kingdom! How could not include a Malick film? I was so close to adding a Miyazaki film. Man, there were too many good films, I need to continue on with this list. They would be. Here's hoping they get released soon! Brilliant post! I'm glad you highlighted The Fall, a wonderful movie that doesn't seem to get much attention. I know! It is criminal. That movie is phenomenal. Ooh, pretty. :) I really need to see The Fall. A few additions that come to mind are Doctor Zhivago, Pierrot le Fou, and Eyes Wide Shut. I need to see those three! Wow, this is a seriously great (and great looking) post. LOVED seeing A Single Man and Boogie here. Only one off the top of my head I can think to add is Amelie, but I loved all of your picks as well. Thanks! I'd love to see your take on it. Amelie was a wonderfully colourful film.